Victoria and Jess, your day was just beautiful for your wedding at Spence Cabin in the Great Smoky Mountains National Park! Tyson and I enjoyed being your photographers for your wedding day. Victoria, your dress was gorgeous! Spence Cabin offers areas to get ready for the ceremony. The cabin does have power to make getting ready easier. Jess looked sharp in his military attire for his wedding day. Thank you for your service to our country Jess! Victoria’s oldest son walked her down the isle at Spence Cabin in the Great Smoky Mountains. The sitting over the creek is a perfect location for weddings in the Great Smoky Mountains. Jess’s expression as he watched his bride walk towards him was priceless. You can see the love in his expression. Victoria’s three sons watch quietly as their mom weds Jess. Being able to get close up shots without being intrusive to the ceremony is an important aspect at Kathy Smith Photography. Our photograph gear enables us to be away from the couple’s space but still be able to capture the intimate moments. The pouring of colorful sand into an hour glass has become a symbol of unity for many couples. Involving Victoria’s and Jess’ children was very touching. After the pouring of the sand, all the children joined the couple for the remainder of their ceremony. Capturing special moments like these is what we watch for! Notice in the second image that a visitor flew through just in time! The creek that runs behind Spence Cabin makes a beautiful backdrop for their portraits. Apple Pie anyone? The couple opted to have a pie instead of a cake and it was a huge hit! Victoria dancing with her three sons. You can tell they do this often and not just at the wedding. I had the pleasure of photographing their engagement session and they used one of the images for a signature matted image at the reception. Spence Cabin’s front door was the perfect place to end the day! Thank you, Victoria and Jess, for being such wonderful people to work with. 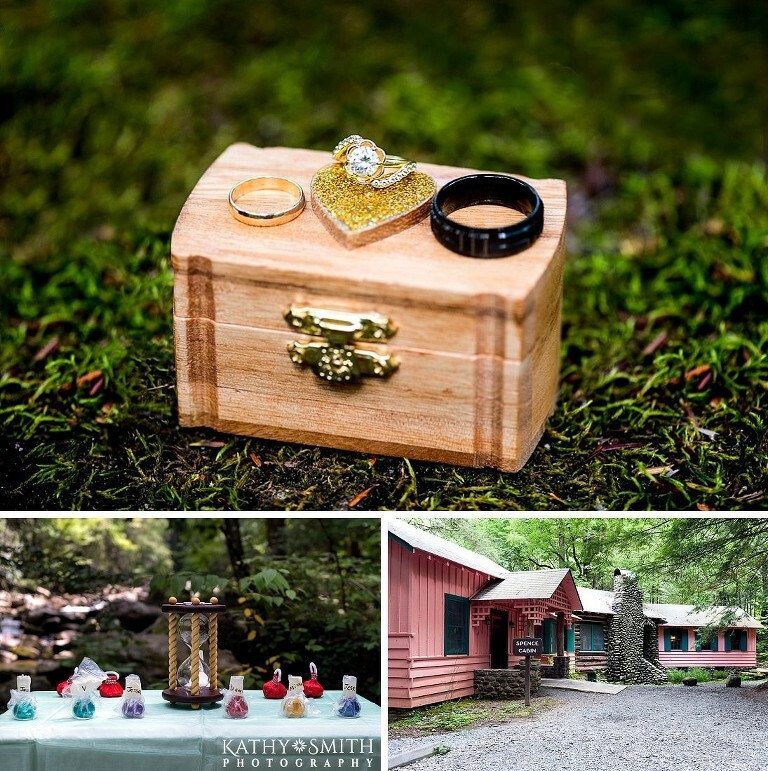 We enjoyed being your wedding photographers at the Spence Cabin in the Great Smoky Mountains National Park! 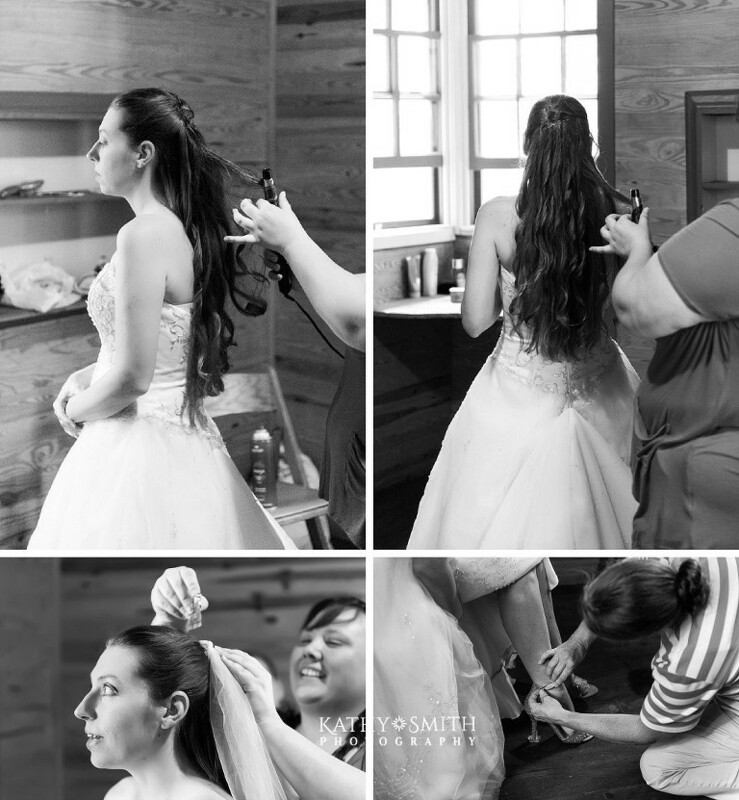 If you are planning a wedding in the Great Smoky Mountains, I am more than willing to work with you to create the perfect wedding collection to capture your special day! Note: I hold a CUA (commercial use authorization) permit with the National Park Service which gives Kathy Smith Photography permission to do wedding photography and portrait photography in Cades Cove and all areas of the Great Smoky Mountains.